We’re plum-crazy for this Italian Plum Torte with Tantalizing Plum Glaze! This dessert is simple yet elegant, sweet yet a bit sour, mundane yet magical. The magic occurs when the recipe combines the best of a pineapple upside-down cake with the classic French fruit tart, tarte Tatin. 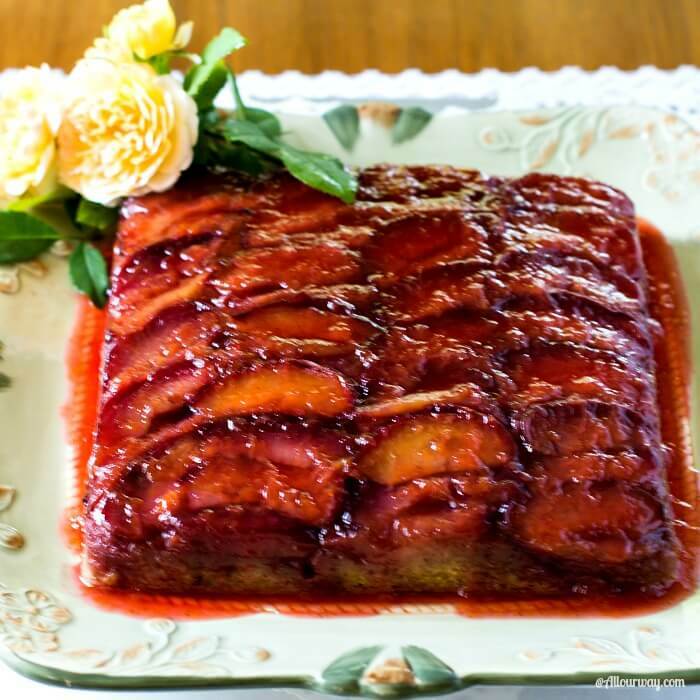 A simple butter cake transforms into an elegant fruit torte glazed with a tasty plum sauce. It started with wanting to create a special dessert for our daughter Shelley’s birthday. For past birthdays we made many types of cake including Italian Cream Cake and Tiramisu Cake with Zabaglione Topping. This year her birthday dessert was going to be different. It was going to be special. It was going to be magical! 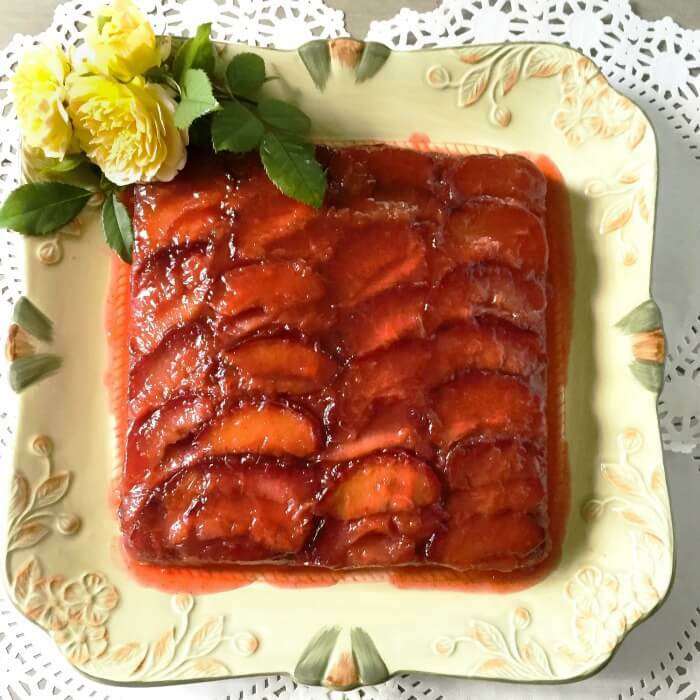 We ended up creating Italian Plum Torte with Tantalizing Plum Glaze. And magical it was. The caramely plums on the bottom embedded in the buttery cake and then the fruit imparted a sweet-sour complexity to the buttery cake. The end of the sorcery occurred as the torte rested overnight and the juices from the plums seeped out and became one with the torte, making it unbelievably moist and decadent. Sometimes a mistake in the preparation of a recipe, like English Muffins, yields a better result than the actual dish. This also happened when one of the Tatin sisters, Stéphanie, created a one crust upside-down apple tart. 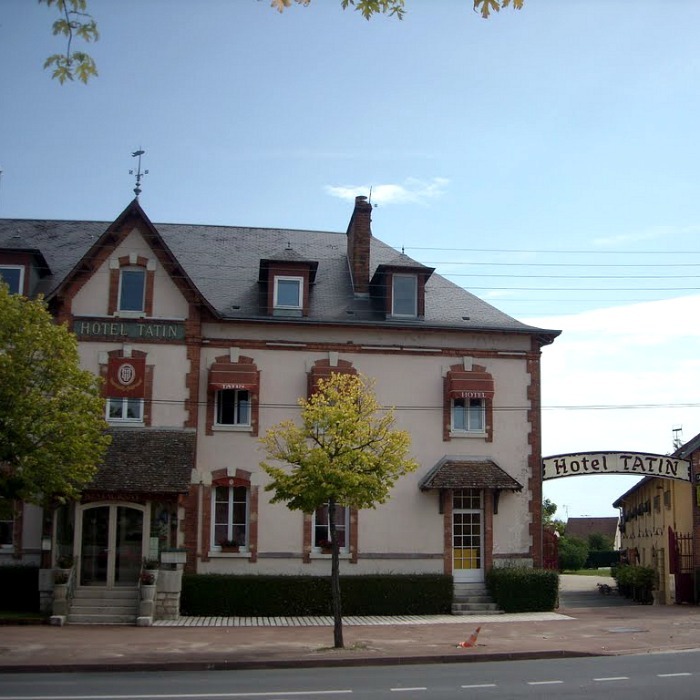 Two French sisters, Caroline and Stephanie Tatin, lived in Lamotte-Beuvron, a rural town in the Loire Valley of France. Caroline ran the Hotel Tatin while Stephanie was in charge of the kitchen. Now, I picture Stephanie like Aunt Bee in the Andy Griffith show. She’s a great cook, a sweet person, but not the sharpest knife in the drawer. Stephanie’s specialty was her apple tart, served perfectly crusty and caramelized, a dessert that melted in the mouth. One day during hunting season, there was a mad dash to get everything ready for the guests. Stephanie was in the kitchen trying to multi-task, which was not her forte. She was busy cooking for a large group, so busy she forgot about the apples sautéing in the butter and sugar. “Do I smell something burning?” asked Caroline from the dining room. Stephanie ran to the stove. “Merde!” She never cursed, but this called for a strong expletive! How could she salvage her apple tart? She glanced around to make sure no-one was looking. Oh dear, she thought. Then she saw the round pastry bottom waiting on the table and immediately an idea popped in her mind. She plopped the dough round on top of the dark apples and stuck the dessert in the oven to finish baking. Once the tart baked, Stephanie took the upside down tart out, and before it even had a chance to cool, upended it onto a platter and rushed it to the dining room. She hurried back into the kitchen and held her breath. To her surprise, the hotel guests were delighted with this new dessert. Legend goes that news of this dessert traveled all the way to Paris, France. Maxim’s owner, Louis Vaudable, decided he wanted the recipe, so he went to spy on the Tatin kitchen in order to ferret out the secret. He got himself hired as a gardener even though he didn’t know anything about gardening. Louis failed at gardening, the hotel fired him, but he succeeded as a spy. The tarte Tatin got me to thinking. Why stick plums into the batter of a cake? Why not make an Italian Plum Torte and make it like Stephanie did only with sliced plums and a buttery batter instead of a crust? Then I asked myself, why not use almonds in the recipe? Italians love their almonds and they use them in many of their rustic desserts! After the dessert cooled for 30 minutes, Honey and I upended the dessert onto the platter. It looked gorgeous but I wanted to bring out more of the beautiful purple color of the plums. 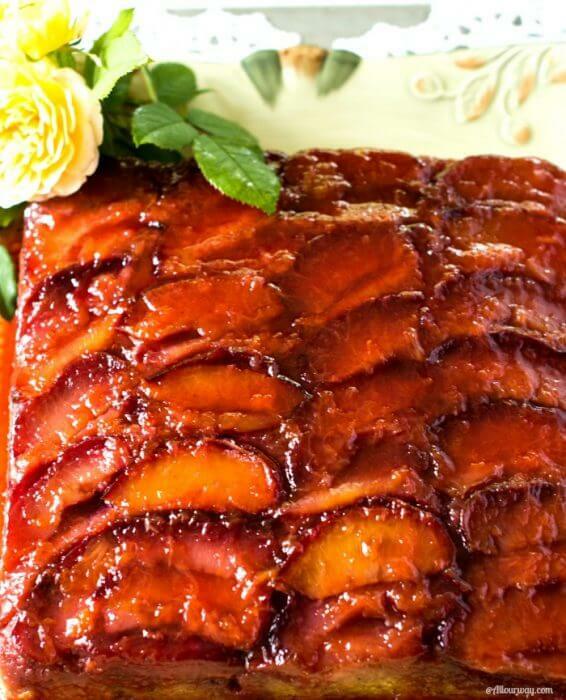 An idea immediately came to mind — a plum glaze. Serve the torte warm with whipped cream or crème fraíche. Be sure to sign up for our weekly newsletter. We’d love to share what we’re cooking and baking in our kitchen. There are a lot of new recipes we’ll be posting. This is a plum studded buttery dessert that is simple yet elegant, sweet yet sour, mundane yet magical. The caramely plums embed in the moist cake and the juice seeps out and becomes one with the cake. Spray pan with vegetable spray. For the plums, place 6 Tablespoon butter in an 8-inch-square pan, or 9-inch-round, 2-inch deep cake pan, or an 8-inch springform pan. If using springform pan be sure to wrap the outside with foil. Place the pan in the oven to melt the butter, 4-5 minutes. Remove pan from oven; stir 1 cup brown sugar and brandy into the melted butter in pan. Overlap plum slices in rows if using a square pan or in a circle around the edge if using a round pan. Repeat in smaller circle in center to cover the bottom of pan. For the cake, whisk together flour, baking powder, cinnamon, and salt. Cream softened butter in a large bowl with electric mixer until butter is light and fluffy, 5 minutes. Add 1 cup granulated sugar; cream until sugar dissolves, about 5 minutes more. Add eggs and vanilla; beat until combined. Add dry ingredients to creamed mixture alternately with milk, using a whisk to avoid overmixing. Whisk ingredients only until well blended, cleaning sides of the bowl with a spatula. Add the toasted almonds until combined. Spread batter evenly over plums in pan. Bake the cake until a toothpick inserted in the center comes out clean, about 45 minutes. Let cake cool in pan on a rack, 30 minutes. Run a knife around the edge of the pan; invert the cake onto a serving plate. Let cake stand 1-2 minutes, then lift off the pan. Glaze with the plum sauce. While the cake is baking make the glaze by placing the plums and sugar in a saucepan. Cook over medium heat, stirring with a wooden spoon, until the mixture starts to boil. Add the lemon juice and continue to cook, stirring, for about 5 to 8 minutes, or until the fruit is glazed and a bit softened but not dissolved. Pour the mixture into a bowl and add the vanilla and cloves. Cover and let the sauce come to room temperature. Gently remove the plums from the glaze and place in a container to eat later on yogurt, ice cream, or just plain. Glaze the entire surface of the cake. Serve the cake warm with whipped cream or crème fraîche. Choose plums that are plump and juicy, without wrinkled skin or soft spots. Note: Recipes and content from © All Our Way are copyright protected. Please do or use content or recipes without prior written permission. If you want to share the information, please link to this post. Grazie. this really looks spectacular. 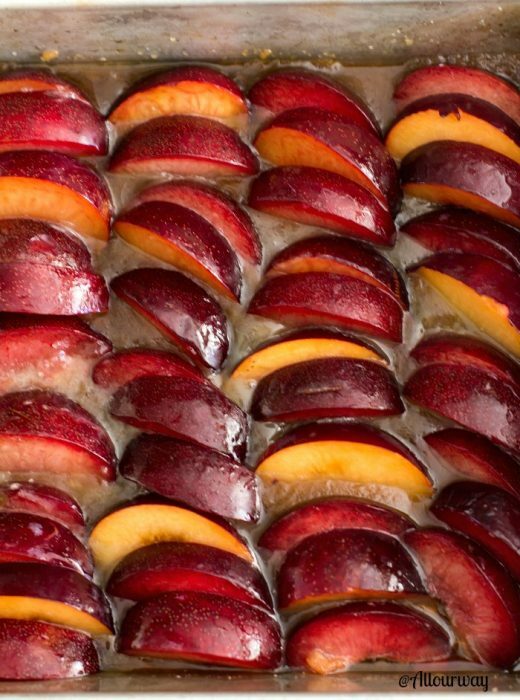 I love how its glistens in the light and plums are a favorite here I bet this is over the top delicious! I think I have some frozen to try this out! hope frozen will work! Marisa, you are an absolutely fantastic cook! I think I’ll move in! Haha! Honestly, this sounds delicious! WOW! What a special dessert! Marisa, you’re not only an awesome chef but a terrific story teller too! Love it! Shared onto Fb, G+, Pn, and Tw. Thank you, Dee! I love discovering where recipes come from. This looks so interesting! I’ve never seen anything like it before. I learn so much reading your posts! My mouth is watering once again! I love the story behind this delicious looking dessert! I loved the story (especially the Aunt Bee reference)! Thank you, KariAnne! I’m so glad I found you in blogdom. You were the first I subscribed to and I read every word in each post. Hugs! My goodness, this is such a delicious looking dessert that sounds so healthy as well. The history of the tarte tatin is amazing and the plum torte could be a great hit with kids at home! Hi, Lisa! The torte itself is very adaptable — you can use any fruit. Thank you for commenting. This is very timely, I want to eat a plum. I will try this, looks delicious to me. Oh, I haven’t tried anything like that. Looks really new to me but I want to try it. Hi, Rose! When you try it, let me know what you think. It’s been a while since I had a plum. This looks delicious! Hello, Ryan! Eat plums and you’ll discover you’ve been missing out on some juicy fruit! It certainly was a great dessert 🙂 One we are going to repeat perhaps with another fruit. Have a wonderful day! Hi, Aziel! Let me know if you make it — for us it’s a keeper. Oooh, that sounds all kinds of delicious! I absolutely love plums, but don’t think I’ve ever used them in a dessert, which is totally a #MyBad moment, lol. I’m definitely going to remember this recipe next time I bring a bag of plums home, yum! Thanks for the inspiration! Hi, Aeryn! You will really love it! It is so moist and flavorful. If you make it let me know how you like it. Hi, Victoria! It is really easy to make and you can still find plums. Have a good weekend. Oh my goodness this sounds so delicious. Great job on this. It’s a really impressive looking dessert! Thank you, Liz! That’s very kind of you to say. It really was easy to make. I really enjoyed reading the history and the backstory of this lovely dessert! It’s so decadent and it’s definitely one of the desserts that will make your day so much better. A slice of this and a cup of my favorite tea and my life is complete! Thanks for sharing the history of the tarte tatin. 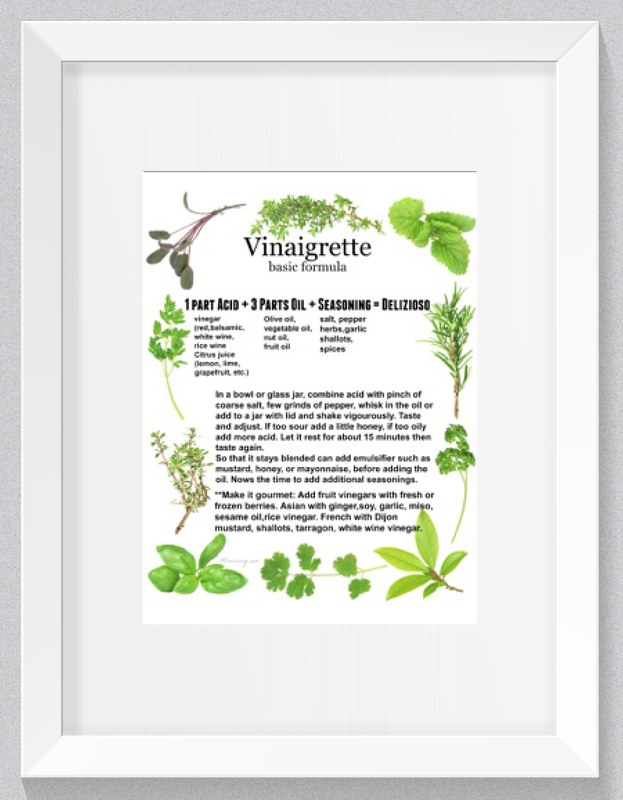 I’m always fascinated to learn about how recipes came into being. The plum torte looks amazing. Thank you, Cin! I’m fascinated by food history, also. Thank you, Annie! I hope you saved me some of your fig bruschetta — I’ll take it with goat cheese! Abbracci! Oh wow! That looks amazing. I am definitely trying this recipe over the weekend. I love plums! Thank you, Jocelyn! Is is a delicious torte. Love posts with some history in it. I always like to do that as well – Like to back up with history. And, yes the plum torte looks delicious. All I need is a scoop of ice cream. Thank you, Aish! I love telling stories with recipes — I believe each dish has one. You’re right ice cream would also taste great with it. 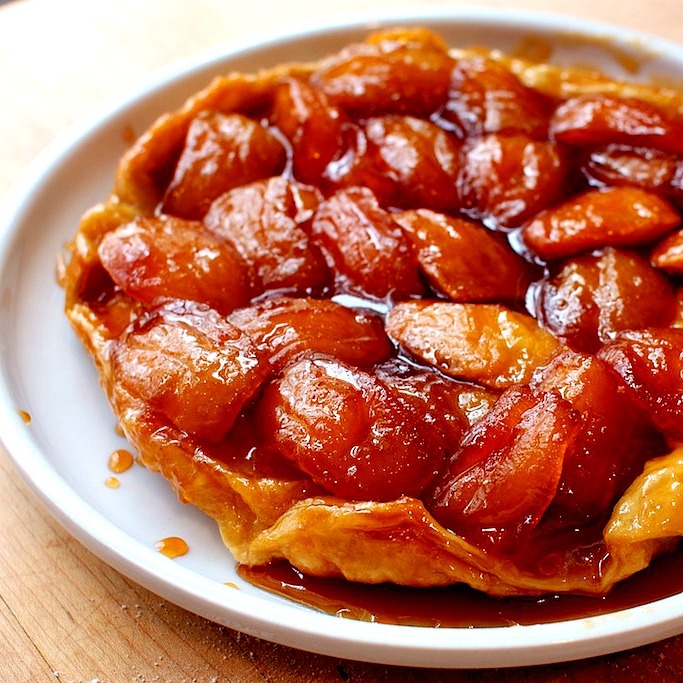 This looks delicious and I loved your version of the story behind the tarte tatin! What a great dessert Marisa. I keep forgetting about plums. I have to get some when I go shopping this week and make your delicious torte. My husband would love this. Thank you, Jovina. Let me know the the torte comes out. This is a beautiful post, recipe and pictures. Very elegant and informational. Thanks.